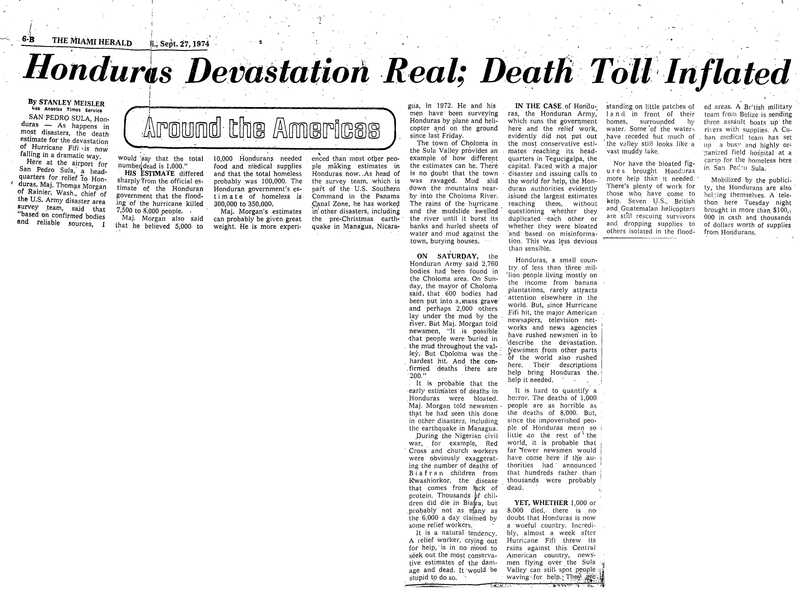 This article is about the hurricane of 1974. For other storms, see Tropical Storm Fifi and Hurricane Orlene. Hurricane Fifi (later known as Hurricane Orlene) was a catastrophic tropical cyclone that killed between 8,000 and 10,000 people in Honduras in September 1974, ranking it as the fourth deadliest Atlantic hurricane on record. Originating from a strong tropical wave on September 14, the system steadily tracked west-northwestward through the eastern Caribbean. On September 16, the depression intensified into Tropical Storm Fifi just off the coast of Jamaica. The storm quickly intensified into a hurricane the following afternoon and attained its peak intensity on September 18 as a strong Category 2 hurricane. Maintaining hurricane intensity, Fifi brushed the northern coast of Honduras before making landfall in Belize the following day. The storm quickly weakened after landfall, becoming a depression late on September 20. Continuing westward, the former hurricane began to interact with another system in the eastern Pacific. Early on September 22, Fifi re-attained tropical storm status before fully regenerating into a new tropical cyclone, Tropical Storm Orlene. Orlene traveled in an arced path toward Mexico while quickly intensifying into a Category 2 hurricane before landfall. The storm weakened after landfall and dissipated fully during the afternoon of September 24 over the mountains of Mexico. Along its path, Fifi impacted nine countries, leaving over 8,200 fatalities and $1.8 billion (1974 USD; $9.14 billion 2019 USD) in damages. Most of the loss of life and damage occurred in Honduras where rainfall from the hurricane, peaking around 24 in (610 mm), triggered widespread flash flooding and mudslides. In a single town, between 2,000 and 5,000 people were killed overnight after a massive flood inundated the area. Fifi brought continuous rainfall to the area for three days, hampering relief efforts in what was the worst disaster in Honduras' history at the time. In nearby Guatemala, an additional 200 people were killed by severe flooding, making Fifi the worst hurricane to impact the country in nearly 20 years. Following the catastrophic damage wrought by the storm, relief agencies from around the world flew in emergency supplies to assist the hundreds of thousands of homeless people. Countries closer to Honduras, such as the United States, set up city donation centers that would send supplies to the country. In efforts to prevent the spread of post-storm diseases, the government allowed the burning of bodies as they were recovered. In a single day, up to 6,000 bodies were burned. Due to the extreme damage and loss of life, the name was retired from the list of Atlantic hurricane names and has not been used since. Hurricane Fifi originated from a tropical wave that moved off the west coast of Africa on September 8. As the storm entered the Atlantic, satellite imagery showed that the system was already well-developed. Traveling westward, the wave entered the Caribbean Sea by September 13. Soon after emerging into the Caribbean, convective activity quickly increased. The following day, a US Navy reconnaissance aircraft flew into the system and found a developing low-level circulation. Operationally, the system was not declared a tropical depression by the National Hurricane Center (NHC) until late on September 15; however, in the Atlantic hurricane database, it was determined that it had become a tropical depression during the afternoon of September 14. The NHC initially forecast the depression to continue its west-northwest track, eventually brushing Cuba, although the storm never took the northerly turn. The depression continued to organize as it turned westward, and late on September 16 the system intensified into Tropical Storm Fifi while just south of Jamaica. As it moved due west, the storm intensified, attaining hurricane status roughly 24 hours after being named following the formation of an eyewall feature. At that time, the storm was asymmetrical, with gale-force winds extending up to 100 mi (155 km) to the north and up to 50 mi (85 km) to the south. The storm turned slightly southwestward, and by September 18, Fifi reached its peak intensity with maximum sustained winds of 110 mph (175 km/h) and a barometric pressure of 971 mbar (hPa; 28.67 inHg). This made Fifi a high-end Category 2 hurricane on the Saffir–Simpson hurricane scale, which had been adopted the previous year. Around this time, the hurricane had nearly doubled in size, with a gale diameter now covering an area 300 mi (485 km) across. Although earlier in the season Hurricane Carmen had attained Category 4 status in a similar location, Fifi was unable to intensify further due to its proximity to land. Most of the southern portion of the circulation was inhibited by the mountains of Honduras as it passed within 20 mi (32 km) of the coast. Fifi maintained its peak intensity for roughly 24 hours until it began to weaken shortly before making landfall near Placencia, Belize with winds of 105 mph (165 km/h). After moving inland, the hurricane weakened to a tropical storm and further deteriorated into a tropical depression once it moved over southwestern Mexico late on September 20. Two days later, the former hurricane emerged back over water near Acapulco, Mexico, becoming the third known tropical cyclone to traverse Central America and enter the northeastern Pacific hurricane basin. When it moved back over open waters, Fifi re-attained tropical storm status; however, it only maintained this intensity for 18 hours before being renamed Orlene. There is disagreement amongst tropical cyclone forecasting agencies as to the role Fifi played in Orlene's development. After the formation or merger of the systems, Orlene began to intensify. During the afternoon of September 23, the storm intensified into a hurricane as it quickly traveled towards the north-northeast. Shortly before making landfall, a small eye developed within the center of the hurricane, resulting in the NHC upgrading it to a Category 2 storm with maximum winds of 105 mph (165 km/h). However, the EPHC reported that the storm peaked with winds of 80 mph (130 km/h). Rapid weakening took place following the storm's landfall, degenerating into a remnant low just six hours after moving inland. The remnant system persisted for several more hours before dissipating over the mountains of Mexico. On September 15, the Government of Jamaica began preparing for potential impacts from the storm. Residents were advised to be aware of possible rain squalls in association with the storm. Additionally, small craft advisories were issued due to rough seas produced by the then-tropical depression. Passing south of Jamaica as a tropical storm, Fifi brought heavy rains to the mountainous island, exceeding 8 in (200 mm) in some locations. Severe flooding affected parts of Kingston, leaving some areas under 2 ft (0.61 m) of water. Damages from the storm amounted to hundreds of thousands of dollars, although no loss of life was reported. In nearby Hispaniola, the system produced moderate rainfall that triggered flash flooding. Small craft advisories were also issued for portions of southern Cuba as Fifi bypassed Jamaica. Ships were advised to remain in port throughout the Cayman Islands as residents began to prepare for hurricane-force winds. Fifi first became a threat to Honduras on September 17 when the storm reached hurricane strength, at which point forecasters revised their forecasts to anticipate landfall in Honduras or Nicaragua on September 18 or 19. In response, officials in Honduras urged hundreds of thousands of residents to evacuate from coastal and flood-prone areas. Despite the warning, relatively few heeded these evacuation orders, likely playing a role in the large loss of life following the storm. During the first day of the hurricane's onslaught, the region experienced winds of up to 132 mph (212 km/h) and unrelenting rainfall. The first reports of damage from the Honduran government via radio stated that 14 people had been killed while over 100 were missing. In just 24 hours, 182 towns and villages were completely destroyed. According to the Red Cross, between 800 and 1,200 people died within 12 hours of Fifi's landfall in Honduras. Buses driving through mountain passes skidded off the sides of cliffs due to slick roads, killing numerous people. Flash floods destroyed thousands of homes and isolated numerous towns. Waves, reaching 10 ft (3.0 m) in height, destroyed moorings and grounded numerous ships. Continuous rain fell throughout September 19, resulting in widespread mudslides that killed over 2,000 people. A large mudslide blocked the Choloma River, preventing water from the river and the accumulated 20 in (510 mm) of rain caused by Fifi from reaching the ocean. The waters were released from this natural dam on September 20, when a concrete bridge broke upstream and tore through the mudslide. The torrent of water flowed down the valley, triggering a massive flood. The city of Choloma was decimated, with an estimated 2,800–5,000 people killed out of a population of 7,000. This accounted for roughly 20–25% of the storm's total fatalities. [contradictory] The flood occurred during the nighttime, so most residents were unaware of the impending catastrophe. Other towns along the coast suffered similar fates as Choloma. In Armenta, roughly 400 families disappeared after a large landslide buried the town. However, the town is hardly known by people in the country and reports from the area were scarce. Another coastal town, Omoa (population of 2,500 to 3,000) was completely destroyed overnight on September 19. All of the residents were assumed to have perished; however, like Armenta, few people know of the town and estimates of the fatalities in it ranged from 30 to 3,000. Although by this time the storm was situated inland over Mexico, its circulation continued to produce thunderstorms over Honduras, hindering rescue efforts. Nighttime rescues were prevented by dense fog blanketing most of the mountain valleys. The city of La Ceiba, population 53,000, was completely isolated from surrounding areas. Many were feared dead as newspapers reported bodies floating down rivers. The death toll rose by the hundreds every day; at one point, the official death toll was estimated as high as 10,000. There is still uncertainty in the total number of fatalities due to Fifi. In general, however, most estimates range from 8,000 to 10,000. Overall this ranked Fifi as the third-deadliest Atlantic hurricane on record at the time. It was eventually lowered to fourth after Hurricane Mitch in 1998 wrought similar destruction in the same region, leaving between 11,000 and 18,000 dead. Throughout the country, Fifi inflicted nearly $1.8 billion (1974 USD; $9.14 billion 2019 USD) as part of what was, at the time, the worst natural disaster in Honduras' history. In certain coastal regions, only structures built on higher elevations were left standing. Many cities were more than 80% destroyed. Fifi demolished over 10,000 well-constructed homes throughout Honduras. An estimated 150,000 people were left homeless due to Fifi. However, the Honduran government estimated that between 350,000 and 500,000 were left homeless. The country's banana crop was completely destroyed by the hurricane; as a result, its economy was severely affected. Officials in Belize and Guatemala rushed to complete emergency precautions for the approaching hurricane. Much of Central America north of Nicaragua was impacted by the hurricane. Rainfall reaching 4 in (100 mm) affected areas as far north as Campeche, Mexico. At Chinandega, Nicaragua, rainfall from the storm amounted to 14.5 in (370 mm) over a four-day period. The heavy precipitation led to significant flooding across the country as dozens of rivers exceeded their banks; hundreds were left homeless. The communities of La Conquista, Dulce Nombre, San Gregorio and San Vicente were isolated by flood waters after roads leading to them were washed away. In Chiquito, Izapa and Tamarindo, more than ten homes were destroyed and 50 people left homeless due to the storm. After the Río Coco overflowed its banks in Jinotega, 120 homes were destroyed, leaving 113 families homeless. Numerous other communities sustained similar damage throughout the country, especially near the Honduras border. Hundreds of people in the town of Wiwili clung to treetops and roofs along the Coco River. Although the storm made landfall in Belize, the country suffered considerably less damage than in nearby Honduras. However, winds up to 109 mph (175 km/h) were recorded. The combination of winds and torrential rains damaged or destroyed hundreds of homes in Belize. Waves along the coast reached 12 ft (3.7 m) above normal. Although torrential rains exceeding 24 in (610 mm) fell in nearby Honduras, only 6 in (150 mm) fell in the country. The country's $800,000 banana crop was completely destroyed by the storm. Despite the severity of the damage, there were no reports of fatalities in Belize. In Guatemala, the weakened storm brought extreme rainfall that caused extensive flash flooding. 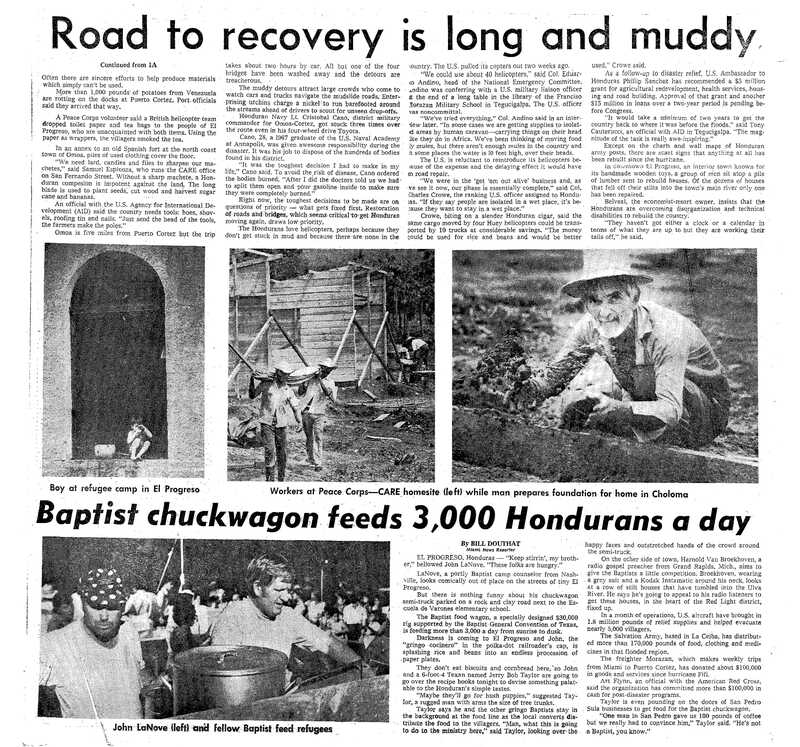 Numerous bridges, roads and homes were washed away or destroyed. At least 200 people were killed, making Fifi the deadliest in the country in nearly 20 years. In El Salvador, the outer bands of Fifi produced flooding rains that killed at least ten people. As Fifi tracked over Central America, the outer fringes of the storm produced 4 in (100 mm) of rainfall as far north as Campeche. Mexico sustained little or no damage from Hurricane Fifi. Once re-designated as Hurricane Orlene, however, the storm impacted the Pacific coast of Mexico as a Category 2 hurricane. There were no reports of casualties or major damage. In Acapulco, reports indicated that 11 in (280 mm) of rain fell within a six-hour span. Remnant moisture from the hurricane brought minor rainfall to portions of Arizona. Following the severe damage and unprecedented loss of life caused by Hurricane Fifi, its name was retired at the end of the 1974 season. As such, the name was removed from the rotating lists of names used in the Atlantic hurricane basin. 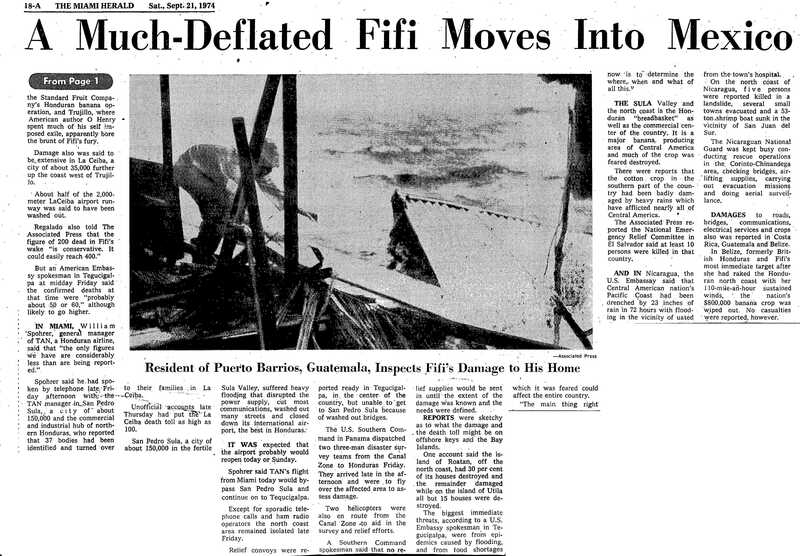 However, Fifi was not replaced by any particular name due to a change in the Atlantic hurricane naming scheme in 1979. In the wake of the storm, relief agencies and the Honduras government were overwhelmed by the magnitude of the disaster. Rescue planes flown throughout the country reported that hundreds of bodies were floating in rivers and water covered areas once occupied by towns. For the first three days, relief efforts were generally minimal due to the extremely poor state of the roads across Honduras. Numerous countries send tonnes of aid to the battered country, although it was initially stockpiled by the government until it could be properly distributed. By September 24, planes filled with relief supplies were being flown to Honduras from the United States, Cuba, Costa Rica, El Salvador, Mexico, Guatemala and Venezuela. Relief crews, overwhelmed by the number of bodies, began taking desperate measures to prevent the spread of diseases. An estimated 5,000 to 6,000 bodies were burned by September 24. Four helicopters supplied by the United States, from the Panama Canal, quickly began rescue missions. They airlifted survivors from flood waters and placed them on elevated land areas. The crew members reported that the people were desperate to get on the helicopters and during one mission, 34 people crowded on to one of the aircraft, which has a normal capacity of 15. Food packages dropped to survivors were fought over, some people reportedly fighting each other with machetes for the supplies. During several of the later rescue missions, people died from starvation and malnutrition on board the helicopters. From nearby Belize, Britain deployed 57 soldiers with motorboats to rush food to survivors in flooded regions. A group of 41 Cuban medical experts, including 21 doctors, treated nearly 900 in a period of two days. By September 24, more than 350,000 people sought refuge in shelters set up throughout the country. Red Cross volunteers were overwhelmed by the number of families requesting help to find missing relatives. Relief planes sent by the United States were initially delayed by continued inclement weather. Several days after the storm's passage, they were able to land in the country. These planes were loaded with food, clothes, water, medicine and other emergency supplies. Juan Bautista described the disaster wrought by Fifi as "the worst moment in the nation's 150 year history since independence." Donation centers were set up throughout major cities in the United States by the Honduran Government. They planned to fill three planes and five or six ships with supplies that would be brought to the country. In Miami, Florida, governor Reubin Askew asked all residents to donate to the Red Cross or Salvation Army to help those affected by the hurricane. In St. Petersburg, Florida, a team of 14 doctors was sent to the country on October 9. Other doctors set up fund drives, one set for $50,000; however, officials in Honduras believed that this would be nowhere near the necessary funds for what would become a multibillion-dollar disaster. Numerous other nations and relief agencies joined in the effort to aid Honduras in what was considered one of the largest relief operations in history. Days after the storm, brigades, deployed by the Honduran military, began to reach the hardest-hit areas as floodwaters started to recede. From Miami alone, 14 tons of relief goods were donated to Honduras. Roughly a month after the storm struck, the United States had donated roughly 1.8 million pounds (816,000 kg) of relief supplies. Government agencies also began working on plans to revive the broken economy. An initial plan costing $5 million to restart the agricultural business was set up and another $15 million was set to be given out as a two-year loan. One group of people from a Baptist church in Texas spent $30,000 on a custom-designed food wagon to distribute food to the people of El Progreso. In some areas, residents did not know how to use certain supplies, such as toilet paper and tea bags, due to their culture and isolation from urban areas. "...a British helicopter team dropped toilet paper and tea bags to the people of El Progreso, who are unfamiliar with both items. Using the toilet paper as wrappers, the villagers smoked the tea." In Honduras, the Red Cross and other relief agencies quickly attempted to unload planes to assure that supplies would reach victims. However, some of the supplies were hoarded by the Honduran military as they quickly went to unload the planes. One of the incidents took place after a plane carrying supplies from Argentina landed and the military forced the volunteer members away from the plane. Once in the hands of the military, the fate of the supplies was unknown. As the full amount of supplies did not reach victims, reports of people starving to death surfaced. Eventually, relief crews found these reports to be true as they distributed food to those who survived. Following the storm, the country's economy suffered for two years. During this time, the annual decifit reached $200 million, against the annual income of $153 million. In 1977, a large-scale reconstruction project involving six villages across Honduras began. The first of the six project areas contained 121 homes with an average of 25 square meters of space. It was located along an important highway in northern Honduras; however, the rebuilding was initially delayed by erosion issues. The second plan consisted of 127 homes roughly a mile south of the first. The third, consisting of 26 concrete homes, was placed in the city of El Progreso. This project was determined to house the most people per home, roughly seven occupants for a preliminary total of 182 people. The fourth was the most isolated of the six planned constructions. In a rural area far outside urban regions, 92 homes were planned to be constructed. The fifth project, consisting of 33 homes, was placed close to the first project, having a similar access to the major highway. The final housing project, and largest, was set up south of the destroyed town of Choloma. A total of 600 homes, all built on concrete blocks and doubled up, were placed in this housing project. ^ a b c d e f g National Hurricane Center (1975). "Hurricane Fifi Preliminary Report Page One". National Oceanic and Atmospheric Administration. Retrieved November 8, 2009. ^ a b c d e f g h i "Atlantic hurricane best track (HURDAT version 2)". Hurricane Research Division (Database). National Hurricane Center. May 1, 2018. Retrieved April 23, 2019. ^ Staff Writer (September 16, 1974). "Weather". Boca Raton News. Retrieved November 8, 2009. ^ "Hurricane Fifi". The Evening Independent. Associated Press. September 17, 1974. Archived from the original on July 18, 2012. Retrieved November 10, 2009. ^ Jack Williams (May 17, 2005). "Hurricane scale invented to communicate storm danger". USA Today. Retrieved November 8, 2009. ^ a b c National Hurricane Center (1975). "Hurricane Fifi Preliminary Report Page 2". National Oceanic and Atmospheric Administration. Retrieved November 8, 2009. ^ Stephen Caparotta; D. Walston; Steven Young; Gary Padgett (2009). "Subject: E15) What tropical storms and hurricanes have moved from the Atlantic to the Northeast Pacific or vice versa?". National Hurricane Center. Retrieved November 8, 2009. ^ a b c Hurricane Specialists Division (2009). "Eastern Pacific Best Tracks, 1949–2008". National Hurricane Center. Archived from the original on July 15, 2009. Retrieved November 8, 2009. ^ a b "Tropical Depression May Grow". The Ledger. Associated Press. September 15, 1974. Retrieved November 8, 2009. ^ "Tropical Storm Fifi Seen Near Jamaica". The Times-News. Associated Press. September 16, 1974. p. 8. Retrieved April 28, 2010. ^ United Press International (September 17, 1974). "Storm Fifi expected to intensify". Bangor Daily News. p. 40. Retrieved April 28, 2010. ^ Staff Writer (September 19, 1974). "Fifi Slams Honduras, Kills 14". Eugene Register-Guard. Archived from the original on July 12, 2012. Retrieved November 9, 2009. ^ a b c d e f "Aid Efforts Start For Honduras, Fifi Deaths Soar". Pittsburgh Post-Gazette. Associated Press. September 24, 1974. Retrieved November 8, 2009. ^ a b c d "Hurricane Fif Kills 7,000". The Prescott Courier. Associated Press. September 22, 1974. Archived from the original on January 24, 2013. Retrieved November 9, 2009. ^ a b c d United Press International (September 22, 2009). "Hurricane Fifi, Her Fury Leaves 5,000 Dead In Central America". Boca Raton News. Retrieved November 9, 2009. ^ Staff Writer (September 24, 1974). "Outside Nations Bring Supplies For Hondurans". The Miami Herald. p. 12A. Retrieved April 28, 2010. ^ Edward N. Rappaport; Jose Fernandez-Partagas (May 28, 1995). "The Deadliest Atlantic Tropical Cyclones, 1492–1996". National Oceanic and Atmospheric Administration. Retrieved November 8, 2009. ^ National Climatic Data Center (1999). "Mitch: The Deadliest Atlantic Hurricane Since 1780". National Oceanic and Atmospheric Administration. Archived from the original on July 17, 2012. Retrieved November 8, 2009. 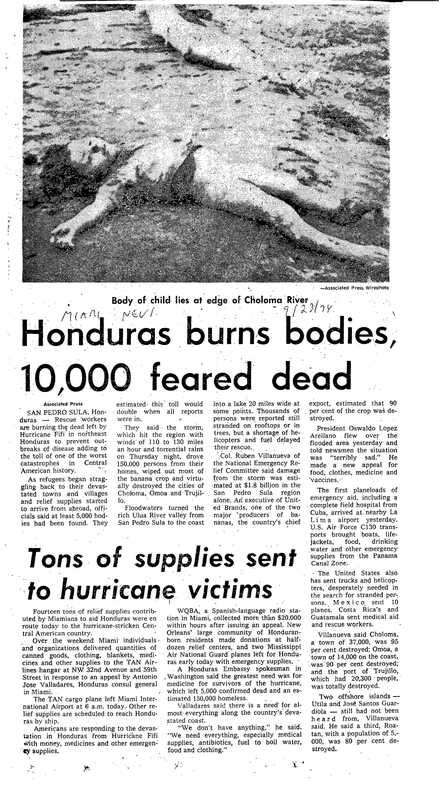 ^ a b "Honduras Burns Bodies, 10,000 Feared Dead". Miami News. Associated Press. September 23, 1974. Retrieved November 11, 2009. ^ Stanly Meisler (September 27, 1974). "Hurricane Devastation Real; Death Toll Inflated". Miami News. Retrieved November 11, 2009. ^ U. S. Geological Survey. "Landslide Response to Hurricane Mitch Rainfall in Seven Study Areas in Nicaragua" (PDF). Retrieved 2007-02-19. ^ a b c Dr. Wilfried Strauch (November 2004). "Evaluación de las Amenazas Geológicas e Hidrometeorológicas para Sitios de Urbanización" (PDF). Instituto Nicaragüense de Estudios Territoriales (INETER). p. 11. Retrieved 2009-11-07. ^ "Nicaragua - Hurricane Joan". ReliefWeb. 1988-10-26. Retrieved 2009-11-07. ^ Daniel P. Brown. "Tropical Cyclone Report: Tropical Storm Alma" (PDF). National Hurricane Center. Retrieved 2008-11-29. ^ Lixion Avila. "Preliminary Report: Hurricane Cesar - 24-29 July 1996". National Hurricane Center. Retrieved 2008-11-29. ^ Lixion A. Avila and John Cangialosi (January 14, 2010). "Tropical Cyclone Report: Hurricane Ida" (PDF). National Hurricane Center. Retrieved January 14, 2010. ^ Jack Beven. "Tropical Cyclone Report: Hurricane Felix" (PDF). National Hurricane Center. Retrieved 2008-01-18. ^ Richard J. Pasch and David P. Roberts. "Tropical Cyclone Report: Hurricane Beta - 26-31 October 2005" (PDF). National Hurricane Center. Retrieved 2008-11-29. ^ "Hurricane Fifi Soaks Honduras". Ocala Star-Banner. Associated Press. September 18, 1974. Archived from the original on July 12, 2012. Retrieved November 9, 2009. ^ Staff Writer (2004). "huracán Fifí (1974)" (in Spanish). Dirección General de Meteorología. Archived from the original on February 28, 2009. Retrieved November 8, 2009. ^ "A Much-Deflated Fifi Moves Into Mexico". The Miami Herald. Associated Press. September 21, 1974. p. 18A. Retrieved April 28, 2010. ^ "Floods Still Threaten Texas; Fifi In Mexico". Daytona Beach Morning Journal. Associated Press. September 21, 1974. p. 7. Retrieved April 28, 2010. ^ Staff Writer (September 24, 1974). "Today's Weather". The Prescott Courier. Archived from the original on July 12, 2012. Retrieved November 8, 2009. ^ National Hurricane Center (April 22, 2009). "Retired Hurricane Names Since 1954". National Oceanic and Atmospheric Administration. Retrieved November 10, 2009. ^ "A Hurricane in Honduras (Page One)". The Times. October 7, 1974. Retrieved November 10, 2009. ^ "After Fifi, comes starvation". The Age. September 26, 1974. Retrieved November 10, 2009. ^ "A Hurricane in Honduras (Page Two)". The Times. October 7, 1974. Retrieved November 10, 2009. ^ "350,000 refugees from Fifi, U.S. begins relief task". Chicago Tribune. September 24, 1974. Retrieved November 9, 2009. ^ a b United Press International (September 23, 1974). "Hurricane Ravages Honduras". Daily Collegian. Retrieved November 9, 2009. ^ "Second Fifi relief trip set". St. Petersburg Times. October 9, 1974. Retrieved November 10, 2009. ^ "$50,000 Sought Locally For Honduran Relief". Pittsburgh Post-Gazette. September 23, 1974. Retrieved November 10, 2009. ^ United Press International (September 22, 1974). "Hundreds perish from storm". Rome News Tribune. Retrieved November 9, 2009. ^ "Fifi Death Toll At 4,000". Ocala Star-Banner. Associated Press. September 20, 1974. Retrieved November 9, 2009. ^ a b Bill Doutheat (October 1974). "Road to recovery is long and muddy". Miami News. Retrieved November 11, 2009. ^ "Choking the Wells of Charity". Pittsburgh Post-Gazette. October 14, 1974. Retrieved November 10, 2009. ^ "Fifi survivors die of hunger". Chicago Tribune. September 25, 1974. Retrieved November 10, 2009. ^ Alcira Kreimer (1976). "Housing Reconstruction in the Caribbean and Latin America" (PDF). Virtual Library. Retrieved November 12, 2009. ^ Neil Snarr; Leonard Brown (1978). "Post-Disaster Housing In Honduras After Hurricane Fifi: An Assessment" (PDF). Mass Emergencies. Archived from the original (PDF) on 2009-01-05. Retrieved November 10, 2009. Longshore, David (2008). Encyclopedia of Hurricanes, Typhoons, and Cyclones New Edition. Checkmark Books. ISBN 978-0-8160-7409-9.